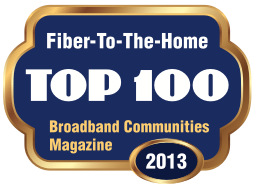 Here is an interesting comment on the Lafayette, Louisiana fiber network. All of this is just the tip of the iceberg. There is much more to come, and much of those are things that I don't even envision myself. If we go back to the early days of electricity in the 1890s, I'm convinced that Thomas Edison never envisioned the microwave oven or the TV-- much less the computer. This fiber capability, this infrastructure, is in its infancy and that's why Lafayette is going to be on the front edge of that development. Lafayette, Louisiana's "third pipe" community broadband network has started signing up customers. Lafayette fought and won a difficult battle against an incumbent lawsuit that tried to stop the community broadband effort, but the city ultimately prevailed in court. The most significant part of the community broadband network is that it offers much higher bandwidth and symmetric bandwidth, which will enable and support small business telecom services and a wide array of work from home and home-based businesses. Will your emergency power work? Catastrophes like Hurricane Katrina are often remembered by a few enduring images. One of them may well be the widely circulated photo of a New Orleans cop, wading through chest high water with an empty gas can, looking for fuel for an emergency generator. It's unfortunate that we tend not to think very much about worst case scenarios unless we see one somewhere, but it is as good a time as any to review your region's disaster recovery plans, especially with respect to telecommunications. With most of New Orleans flooded, wireline communications (phone, cable, Internet) are not working. Most wireless Internet systems (e.g. WiFi hotspots) are also out, because electric power and the wired Internet connections that feed them are out. In what may become a milestone in the quest for broadband, a public referendum in Lafayette, Louisiana to use municipal bonds to fund a fiber network passed by a wide margin (62% of voters said "yes"). Lafayette's public electric utility wanted to offer fiber broadband to its customers a couple of years ago, and the city became ground central for a bitterly fought battle led by the telephone and cable companies, which spent millions to stop the initiative. Lafayette was probably a poor choice to fight the community. In 1896, the town had to form the Lafayette Utilities Service because the big electric companies refused to provide service to the rural community. The Lafayette vote is significant. It was held on a Saturday, and received a 27% turnout, which is pretty high for a single issue vote (it was the only item on the ballot). Politicians across the country will have to look more closely at broadband issues going forward, because the one weakness of the telephone and cable companies is that companies do not vote--but citizens do, and in Lafayette, the citizens spoke loudly and clearly on the issue. All the lobbyist money in the world can't offset citizens determined to make a change. The city says the first customers will get their fiber connections in about two years, and it will take a total of three and a half years to get fiber to every home and business in the community. That's not bad, considering it took almost 40 years to get a telephone to most homes. USA Today has an article about Lafayette, Louisiana, which has been trying to put together a community fiber project for the past year. The southern Louisiana community has apparently been beaten down by BellSouth, which has vigorously opposed the deal. BellSouth has claimed it is "unfair" for communities to offer a service the company could offer, even though it provides only DSL in the community, a pale shadow of the robust fiber network the city was planning. At the risk of boring my regular readers, there are two ways to approach community telecom projects. One is to regard telecom infrastructure just like roads. Communities build the roads, but private companies (like BellSouth) deliver services (like dialtone or TV programming) to customers. The other approach is to regard telecom infrastructure like the municipal water or electric system, in which the city itself provides the customer services. The latter is certainly more efficient, but given that many of our elected leaders still don't take any of this very seriously and given that we have a ridiculously complex regulatory environment, I think the former approach (a public/private partnership) is the only alternative. "The future of Lafayette shouldn't be left to the whim of the big telecommunications companies, insists City Parish President Joey Durel. Installing fiber-optic cable, he credibly argues, is no different from laying down sidewalks or sewer lines. In fact, the "triple play" plan mirrors the action Lafayette's city fathers took a century ago when they realized the private power companies were passing them by in favor of larger, more lucrative markets in Baton Rouge and New Orleans. To survive, they built their own municipal power system.